Money Team: Floyd Mayweather Jr. has signed a deal with Showtime/CBS which will keep his empire at the top for years to come. Floyd Mayweather Jr. has signed a multi-year with Showtime/CBS, it was announced Tuesday. Terms of the deal were not released, but the news ends his 16-year relationship with HBO PPV and almost immediately changes the landscape of how the business is done in boxing. On May 4, Mayweather will fight top-contender Robert Guerrero at the MGM Grand in Las Vegas, Nevada. The event is being dubbed Cinco de Mayweather. 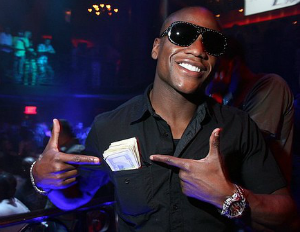 Mayweather last year was named Forbes’ highest-paid athlete with earnings hovering around $85 million. For more on the deal read the report at Y! Sports.